Alex Israel's musings about Israel, Torah and the Jewish World. 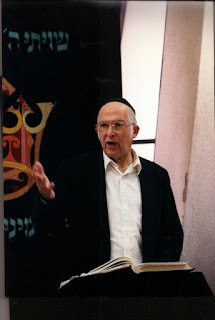 Few people who have impacted my life more than Rav Lichtenstein z”l and yet I have found it exceedingly difficult to write anything about him, both at the time of his passing, and throughout the year . Why? Approaching Rav Aharon was never easy. When I first went to speak to him as an eighteen-year-old, I was so nervous that I would sit on my hands while talking to him because they were shaking so intensely. And later in life, as I got to know and love him, the awe of Rav Lichtenstein never faded. What was it? It was that Rav Lichtenstein was so great: His vast knowledge, his high halakhic standards, his personal piety, his humility, his maximization of every moment, his intellect. It was this that made him so formidable. Rav Beni Lau said: “With Rav Aharon, there was no "I didn't intend that" He was all intention, fully mustered.” He listened to your question so intently, so carefully, that you had to be pedantic in your wording or else he would answer the wrong question. I always felt so inadequate in his presence, always worried that I was falling short, because, after all, who could rise to his immaculate standard. I know that Rav Aharon wouldn’t have said anything critical and he would have welcomed his talmidim approaching him more. But I was reticent. One of my deep regrets is that I never adequately expressed to him just how deeply and profoundly his teachings directed and enlightened my life and thanked him appropriately. I did not visit enough, consult enough. This concern, that I would never adequately manage to capture his greatness in words, is what has prevented me from writing. Don’t get me wrong. This awe was not fear in a negative sense. I loved Rav Aharon deeply. Here was a man whose teachings and guidance had shaped my passions and ideals, my ideology and life course. Here was a man whose words were filled with such truth, such depth, such inspiration, such perspective and insight. I very much loved and respected him. In the last years of his life, I watched his physical and mental decline and I felt the pain and distress as if I was watching my own grandfather. I have never felt such a fusion of love and awe regarding another human being as I felt towards Rav Aharon. As we approach his first Yahrzeit, I do wish to share some of what he meant to me, so here is a hesped that I gave at Yeshivat Eretz Hatzvi a few days after his passing, one year ago. In addition to giving a sense of Rav Lichtenstein’s unique persona, it was an attempt to draw out messages that impacted me, and that could be relevant for a Modern-Orthodox audience. I am sure you have heard a great deal about Rav Lichtenstein in the past week. He was my Rosh Yeshiva. He was the primary leader of the Modern Orthodox world. He could hold forth on any topic with mastery of the Jewish and Secular sources in a comprehensive and lucid manner. But what made him so formidable was not one particular accolade or another. If I may echo Rav Yehuda Brandes' hesped for Rav Lichtenstein, it was the fact that he fused qualities that are rarely found in a single person: The full gamut of Torah learning and Secular learning, Halakhic conservatism fused with enormous intellectual creativity; exceptional personal humility together with bold communal responsibility. For example, his open letter to Prime Minister Menachem Begin in a time of war, offering moral rebuke to the State of Israel! He fused absolute immersion in the heights and breadth of learning, with a concern for the suffering of every single person. Let me again give you two examples of his interpersonal care and empathy. At the shiva yesterday, the former owner of the local makolet recalled how when he left Alon Shevut, Rav Aharon sat at the community "mesibat siyum" for an entire 2 and half hours. This was a man who wasted no time! His family said to him: “Why waste your time at a leaving party for the owner of the makolet?” and Rav Aharon responded: “I bought my chalot from him every Friday! How can I not show appreciation!” I will never forget the vigor with which he danced at every wedding of a talmid, at my wedding; and, in contrast, the tears he shed at the funeral of a woman, a wife of a dear talmid, who had succumbed to cancer in her prime. Rav Aharon burst into heart-rending tears, as if that talmid were his own son. Other fusions that he embodied: He had full dedication to his institution, but also deep commitment to family; his deep spirituality and piety was twinned with absolute worldliness; he had enormously high standards for himself and his students, and yet seemingly total understanding and love when some failed to live up to his worldview. As has been famed, he never let boys carry his books, sometimes carrying fifteen large volumes into shiur. He ran or rushed - around the yeshiva campus so as not to waste a single moment. Rav Aharon encapsulated these astounding traits and achievements, that are commonly exclusive. For that reason, we viewed him as so formidable. That is why we would be loved him so much, revered him so much. We would quake when we went to speak with him. To illustrate this let me share the following. On Shabbat I looked for a dvar torah to say at the table from him. I found one, from seuda shelishit 1992, that I had written down on that Motzaei Shabbat. (We would carefully note his methodical sichot (talks), committing to memory the analysis, the mekorot and occasionally, the accompanying stories or literature quotes and write them down later.) I read the sicha and I was astounded. I didn’t recall the specific sicha at all, but the message, the driving principle - this is a concept I have communicated to my students tens of times. I don’t know - 40? 50? 60 times? And I had no clue I got it from Rav Aharon. His ideas are seeded into my own religious worldview, and deeper than a worldview, into my religious sensibilities. That is what it means עשה לך רב, and that is the only way that I may explain the deep emotional impact his passing has made upon me. What was this mode of thinking? I will relate to just three ideas. First, I would point to, in his phrase, "the complexity of experience." Everything is to be examined from one side and then the other, in reference to the classic sources, in reference to its contemporary impact, deeply, comprehensively. Nothing is simple; always complex. A full evaluation needs to be made. But this never led Rav Aharon to paralysis. After that stage, a decision is made, a course, a path, that is informed and sensitized by these conflicting concerns. This generates a richness, a depth, a way of thinking about every idea. This approach permeates every article, every speech. It was his derekh ha-limmud. after you sat with Rav Aharon, you can never think simplistically again. In my שנה ב he delivered a series of lectures. He told us that he planned to deliver a comprehensive hashkafa (philosophy of life.) Concentric circles: First - Humanity as a whole, then Judaism, then the Yeshiva world, Hesder, and last, Yeshivat Har Etzion. Several of these lectures were written up in the volume “By His Light”. I highly recommend that every one of you purchase the book and read it bechavruta cover to cover. צריך האדם שיכוון לבו וכל מעשיו כולם לידע את השם ברוך הוא בלבד ויהיה שבתו וקומו ודבורו הכל לעומת זה הדבר ...ואפילו בשעה שהוא ישן אם ישן לדעת כדי שתנוח דעתו עליו וינוח גופו כדי שלא יחלה ולא יוכל לעבוד את ה' והוא חולה נמצאת שינה שלו עבודה למקום ברוך הוא ועל ענין זה צוו חכמים ואמרו וכל מעשיך יהיו לשם שמים והוא שאמר שלמה בחכמתו בכל דרכיך דעהו והוא יישר אורחותיך. …no area of life, no area of endeavor should be divorced from avodat Hashem. There is nothing neutral. Whatever a person does, wherever he is, he can strive to structure his life so that it is ultimately geared to being an oved Hashem (though he may not be totally conscious of this at every point). The significance of effort is very considerable in our hashkafa. This can find expression even in inherently trivial areas. For example, the world of sports … real moral greatness and real moral degradation can be seen. If you see someone on the basketball court who wants only to shoot and score, and defense means nothing to him, this is not simply disturbing to another basketball player, but is morally repugnant. I know people for whom this changed their life. A close associate of mine abandoned his place in business school and went to become a medical practitioner. He wanted to rise to Rav Aharon's challenge and to spend every moment of his professional life in the mitzvah of healing people: v’rappo y’rapp-e – rather than the potentially corrosive pursuit of wealth. We could not remain apathetic to this challenge. It entered our psyche and altered our perspective. We live in a world wherein the ideal of self-fulfillment is taken for granted…To many, there is perhaps no other way of seeing things, and they would be surprised that this goal is even being questioned. But surely, Judaism perceives human existence differently: “Vayetzav Hashem Elokim al ha-adam.” Our perception is that man or woman is fundamentally a being who is commanded, who is called, upon whom demands are made. This deep sense of mitzvah made a remarkable shift in my consciousness. Many of us were brought up with a loose notion of Judaism as lifestyle. But Rav Aharon was shifting the stakes here. He was telling us that we must see ourselves as a "mutzuve" – a commanded being. Vocation – our desires and interests – should ideally coalesce with avocation – the dvar Hashem. Now I have simplified these themes. Read the articles; they are nuanced, they are powerful. For me, these themes affected my life. The notion that "yes" I can engage in any human endeavor and be considered an Oved Hashem, a fully-fledged Jew, a lechatchila Jew, but that this undertaking can only be made if one is impressed with our role as a "metzuve" as a sense of answering a divine call, this sensibility, this constant awareness, this sense of mission was writ large in everything Rav Aharon said and did. For Rav Lichtenstein life was one big mission. He would quote John Milton's desire to be: "As ever in my great taskmaster's eye." Rav Lichtenstein breathed that line, and he breathed it into us. Let these teachings inspire us. We cannot become Rav Lichtenstein, but we can learn from his teachings and writings, and use his words to become better human beings, better Ovdei Hashem. תהא נשמתו של רבנו צרורה בצרור החיים.